The International Space Station ( ISS ) has completed more than 100,000 orbits of Earth. It reached this impressive milestone on Monday afternoon (AEST), May 16. The station’s odometer has clocked more than 4 billion kilometres, that’s almost as far as Neptune is from the sun or roughly the same as ten trips from Earth to Mars and back again. Assembled piece-by-piece in space, the station is like some high-tech version of a child’s Lego or Meccano set. It all began with a single piece, the Russian built Zarya module launched on November 20, 1998 on-top a Russian Proton rocket . Technically it’s this part of the ISS that has orbited Earth 100,000 times. Two weeks later, the space shuttle delivered the station’s second building block. The American-built Unity node was joined to Zarya in an historic display of international cooperation, one that has ensured the continued success of the ISS. There are now 15 nations working together to build and operate the station. The third piece of the station, the Russian module Zvezda , was launched in July 2000. Zvezda provided the first living quarters on the ISS, enabling two astronauts to be based on the station. Since November of that year, humanity has had a permanent outpost in space. From those initial pieces, the ISS now consists of 15 different modules fitted to the station during 40 assembly missions that occurred between 1998 and 2011. It spans just over 100m from end to end and NASA describes the station as being larger than a six bedroom house. That’s enough room to provide a home, office and laboratories, and also recreation spaces for the six-member crews that take up residence there. Its growing size not only gives astronauts more room to work and play, but has made the ISS an easy target for stargazers. It regularly passes over most places on Earth and depending on its orientation in space, particularly the position of its expansive solar arrays, the brighter the station appears. The ISS often shines more brightly than any of the stars or planets. To the naked eye, the ISS looks like a small bright light moving quickly and steadily across the sky. It can be seen during early evening or in the pre-dawn sky; times when the sun is below the horizon for us on Earth, but the station is high enough to reflect the sun’s light back down to us. The station travels in the general direction of west to east, as it follows the Earth’s rotation. Some passes of the station are quite short, lasting just a minute or so, but at its best, the station can be seen for up to six minutes tracing a long path across the sky. The ISS orbits around 400km above Earth, on an orbit that is inclined to the Earth’s equator by 51.6 degrees. This is why the station can be seen from most locations across Earth. The highly inclined orbit is part of the Russian/American collaboration on the space station. Such an orbit is best suited to vehicles launched from Russia’s Baikonur Cosmodrome in Kazakhstan, located 46 degrees north of the equator (the ISS orbit is boosted up to 51.6 degrees to ensure that if an accident were to happen during a mission launch no debris would fall into China, Russia’s neighbour). It requires less fuel for the USA to launch to higher inclinations (their launch site at Cape Canaveral, Florida, is at a latitude of 28.5 degrees north) than it would for Russia to launch to lower inclinations. I’ve been fortunate on a few occasions to spot the ISS by accident but it’s surprising how easy it is do a little planning ahead. My website of choice is Heavens Above as it provides star maps that plot the station’s path across the sky. It’s particularly interesting to see if the station is going to pass by any bright stars or planets. The site also allows you to check both backwards and forwards in time, so if you’re not quite sure if that light in the sky was the ISS, you can always go back and check its path and visibility. 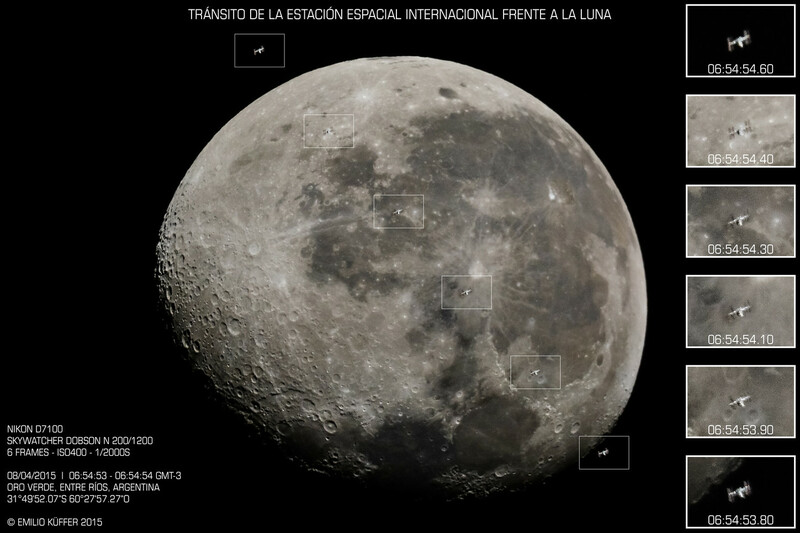 It’s also possible to take planning to a whole new level, such as this fantastic capture of the ISS transiting the moon. NASA has a wonderful program called Spot the Station where you can sign up from anywhere in the world and receive email alerts of when the station is visible from your location. It really can’t get any easier than that. 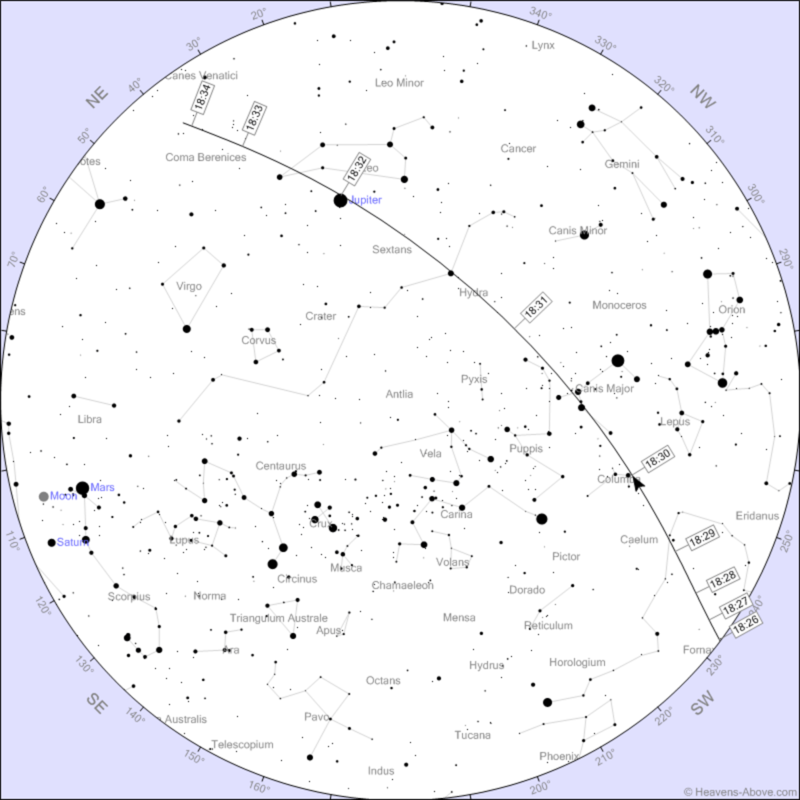 The site also provides an image gallery as well as listings of the next ISS passes. Just remember, while you are looking up at the station it’s amazing to think of the astronauts up there, looking down on us.